I was introduced to AJ Quinnell books after reading Man on Fire when it was re-released at the same time the movie featuring Denzel Washington was. As usual, the book was 100 times better than the movie, and I searched for more from Quinnell. I was disappointed to see that all his other books, four featuring mercenary Creasy, were out of print. Last week I was happy to discover that all of Quinnell's books are now available on Amazon and Amazon Kindle. 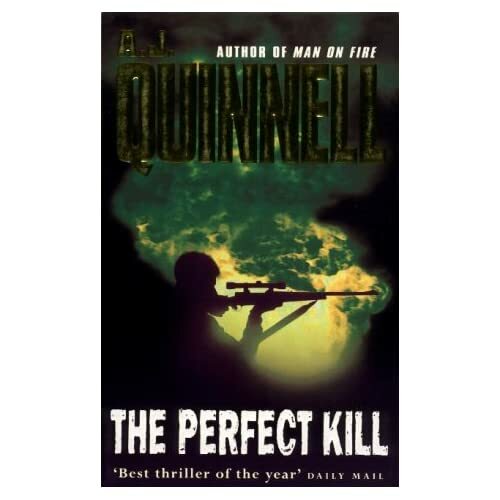 The Perfect Kill is the second of the four Creasy novels. It jumps ahead several years to the bombing of Pan Am flight 103 in Lockerbie. On board were Creasy's wife and four year old daughter, with whom he has lived in peace and contentment on the Mediterranean island of Gozo after his last act of vengeance years earlier. Of course, their deaths awakened the call for revenge and justice that he thought had died many years earlier. Plans for the Perfect Kill are set in motion, and Creasy works methodically and coldly to accomplish his task. Like Man on Fire, I enjoyed The Perfect Kill. It was well balanced between action and story and the character of Creasy. A reader could tire of the coldness of him, or at least of the emphasis of it, only to find that he's not so cold after all, but it was only a minor detraction from a well told and action packed story. Creasy, noting his advancing years, also begins work on a protégé who can not only help with this mission but carry on after Creasy can not. In doing so Creasy learns, in part as a result of what he has caused, that he does not have a, "monopoly on vengeance."